The Muratorian fragment is a copy of perhaps the oldest known list of most of the books of the New Testament. 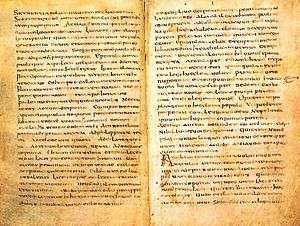 The fragment, consisting of 85 lines, is a 7th-century Latin manuscript bound in a 7th or 8th century codex from the library of Columban's monastery at Bobbio; it contains features suggesting it is a translation from a Greek original written about 170 or as late as the 4th century. Both the degraded condition of the manuscript and the poor Latin in which it was written have made it difficult to translate. The beginning of the fragment is missing, and it ends abruptly. The fragment consists of all that remains of a section of a list of all the works that were accepted as canonical by the churches known to its original compiler. It was discovered in the Ambrosian Library in Milan by Father Ludovico Antonio Muratori (1672–1750), the most famous Italian historian of his generation, and published in 1740. Muratorian fragment is preserved in Milan, Bibliotheca Ambrosiana, Cod. J 101 sup. A few scholars have also dated it as late as the 4th century, but their arguments have not won widespread acceptance in the scholarly community. For more detail, see the article in the Anchor Bible Dictionary. Bruce Metzger has advocated the traditional dating. The unidentified author accepts four Gospels, the last two of which are Luke and John, but the names of the first two at the beginning of the list are missing. Also accepted by the author are the "Acts of all Apostles" and 13 of the Pauline Epistles (the Epistle to the Hebrews is not mentioned in the fragment). The author considers spurious the letters claiming to have Paul as author that are ostensibly addressed to the Laodiceans and to the Alexandrians. Of these he says they are "forged in Paul's name to [further] the heresy of Marcion." Of the General epistles, the author accepts the Epistle of Jude and says that two epistles "bearing the name of John are counted in the catholic church", 1 and 2 Peter and James are not mentioned in the fragment. It is clear that the author assumed that the author of the Gospel of John was the same as the author of the First Epistle of John, for in the middle of discussing the Gospel of John he says "what marvel then is it that John brings forward these several things so constantly in his epistles also, saying in his own person, "What we have seen with our eyes and heard with our ears, and our hands have handled that have we written," (1 John 1:1) which is a quotation from the First Epistle of John. It is not clear whether the other epistle in question is 2 John or 3 John. Another indication that the author identified the Gospel writer John with two epistles bearing John's name is that when he specifically addresses the epistles of John, he writes, "the Epistle of Jude indeed, and the two belonging to the above mentioned John." In other words, he thinks that these letters were written by the John whom he has already discussed, namely John the gospel writer. He gives no indication that he considers the John of the Apocalypse to be a different John from the author of the Gospel of John. Indeed, by calling the author of the Apocalypse of John the "predecessor" of Paul, who, he assumes, wrote to seven churches (Rev 2–3) before Paul wrote to seven churches, he most likely has in mind the gospel writer, since he assumes that the writer of the Gospel of John was an eyewitness disciple who knew Jesus, and thus preceded Paul who joined the church only a few years after Jesus' death. In addition to receiving the Apocalypse of John into the church canon, the author remarks that they also receive the Apocalypse of Peter, although "some of us will not allow the latter to be read in church." However, it is not certain whether this refers to the Greek Apocalypse of Peter or the quite different Coptic Apocalypse of Peter, the latter of which, unlike the former, was Gnostic. The author also includes the Book of Wisdom, "written by the friends of Solomon in his honour" in the canon. ↑ Muratori, Antiquitates Italicae Medii Aevii (Milan 1740), vol. III, pp 809–80. Located within Dissertatio XLIII (cols. 807-80), entitled 'De Literarum Statu., neglectu, & cultura in Italia post Barbaros in eam invectos usque ad Anum Christii Millesimum Centesimum', at cols. 851-56. ↑ Hahneman, Geoffrey Mark. The Muratorian Fragment and the Development of the Canon. (Oxford: Clarendon) 1992. Sundberg, Albert C., Jr. "Canon Muratori: A Fourth Century List" in Harvard Theological Review 66 (1973): 1–41. 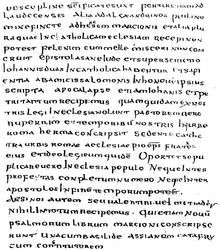 According to The Catholic Encyclopaedia, lines of the Muratorian fragment are preserved in "some other manuscripts", including codices of Paul's Epistles at the abbey of Monte Cassino. Bruce, F.F. The Canon of Scripture. Downers Grove: InterVarsity Press, 1988. Verheyden, J., "The Canon Muratori: A Matter of dispute," Bibliotheca Ephemeridum Theologicarum Lovaniensium (2003), The Biblical Canons, ed. by J.-M. Auwers & H. J. De Jonge, p. 487–556.